LATEST INSIDE Our favorite Instagram features, new Holiday Photo Card templates, and more! Industry News & Announcements, Workshops, and Updates! the season will blow our way, and we are happy to have each of you on the journey with us. NAPCP Retreat 2017, happening January 17-20 in the beautiful seaside town of Santa Barbara, CA. For early birds, you’ll be glad to know registration is now open at www. napcpretreat.com. Katie Rain, of Katie Rain Photography! 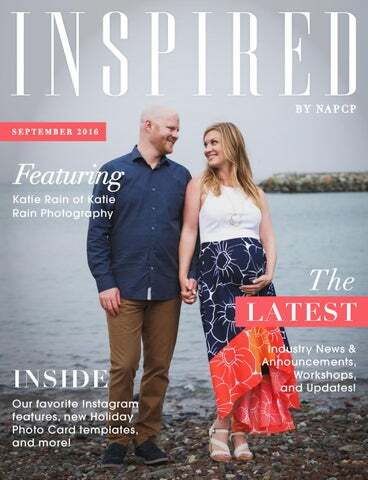 Specializing in natural light lifestyle shoots for maternity, newborns and families, Katie is an award-winning photographer based in the Bay Area. When she’s not behind the lens, she’s chasing after her two kids with a latte nearby. Sounds pretty sweet! underway with winners to be announced soon, including Photographer of the Year. Thank you again to each of you who participated! the theme of “Surviving the Busy Season,” we focused on sharing tips and tools that help streamline productivity. We discussed workflow systems, studio management tools, business apps, editing and production tips, outsourcing and more! Cheers to fall, y’all!! The NAPCP Team PS Inspired is now available to download and print, making it perfect to share with friends and colleagues! Katie Rain Photography! A Cali gal residing in the Bay Area, Katie’s clientele ranges from expectant mommies to itty bitty newborns and families filled with joy. When she’s not behind the lens, Katie’s life consists of spending time with her husband and two kids! Read along to get a glimpse of her beautiful portraits. 8. Favorite musician? Regina Spektor 9. Favorite movie? My Best Friend’s Wedding 10. Recent Favorite Read? “The Admissions” by Meg Mitchell Moore 11. Favorite Client Product? Album with deep matte paper and canvas cover. 12. 3 things you can't live without? My family, running shoes, and coffee! Your Business Bootcamp is a project (and revenue maker!) you use to help fellow photographers. Can you explain what led you to start mentoring? How has it affected you personally and in your business? I absolutely LOVE mentoring others! Setting goals and making vision boards was always something I did as a kid, and that carried through into my adult life. I was that weirdo in a bar at 21 asking people what their goals in life were, haha! When I went to the NAPCP retreat earlier this year, Heidi Hope told us to find our genius zone and I quickly realized that something I had been offering for years to friends could be turned into a service on my website. Getting love notes from my clients and hearing the excitement and drive come back into their voices makes me really happy. I truly believe in community over competition and I love helping others succeed! There is a lovely quality of restraint to the editing of your images. Will you give us a tip or two for finding your style, as a photographer, and staying true to that? Thank you! If you look at my images from 5 years ago, you would cringe and laugh. They are so heavily edited and processed! As I became a better shooter and got more and more images right out of camera, my need to over-edit became less and less. Finding my style was a slow process of eliminating processing steps and ultimately feeling confident in the natural qualities of the image. Tip: aim on getting the white balance, exposure, and composition all correct in the camera, so you are not editing to correct those issues, you are editing to enhance the natural beauty of the image. 1- Send a gift or card to your newborn clients when they turn 1! I send a happy birthday book with a special session offer. 2- Keep your mailing list updated! Send business and personal updates when you can- I usually send one per month. People love feeling connected! 3- Be nice, be professional, be yourself! Itâ&#x20AC;&#x2122;s in my personality to be open and warm to my clients, often acting as a sounding board for new moms who are sleep deprived and overwhelmed. Listening and being kind really goes a long way! e Instagram captures. Enjoy a behind the scenes look at some of her favorite moments! # N A P C P I N S TA FAV E S NAPCP is now featuring some of our favorite instagram captures from the #NAPCP tag each month! Make sure to check out these amazing feeds and follow along! For your chance to be featured, tag #NAPCP on Instagram.